You’ll feel right at home here! At Studio 415, Paul’s diverse experience with people worldwide brings out your best. He’s a father, audio producer and engineer, musician, and champion martial artist. He’s been a radio personality, mobile DJ, live show producer, computer software geek and international business consultant, too! But Paul’s primary focus has always been music and the media. As a professional sound technician in the 1970’s, Paul mixed live New York area performances including Beatlemania and guitarist Al Di Meola. A talented guitarist and vocalist, Paul toured with rock bands through the mid 1980s, opening regularly for national acts including The Joe Perry Project, Blackfoot, and Twisted Sister. Paul excelled in broadcasting school, working on the air as a live radio announcer before he graduated. He also found steady work as a studio guitar and bass player, electronic drum tech, audio/video engineer and music composer for audio, video and cable tv projects. By 1997, Paul had worked professionally in audio and video studios, performed hundreds of gigs as a mobile DJ, opened an entertainment firm and established a specialized audio for video studio. Over the next few years, he traveled extensively as a Business Consultant across the USA and Europe. Since moving to North Carolina in late 1999, Paul has been active in the local music scene as a performer as well as a respected recording engineer/producer. He was a member of well-reviewed local jam band, P3. Many area musicians respect his versatility and solid performing skills, and he’s been invited to sit in at gigs featuring many musical styles. 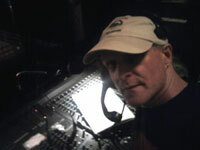 In his capacity as lead sound tech for venues including The Clayton Center for the Arts, Paul has run the board for luminaries including Doc Watson, David Holt, Freddie Cole, Shawn Colvin, The Preservation Hall Jazz Band, The Glen Miller Orchestra, Bill Leslie, The Avett Brothers, Megafaun, Southern Fried Chicks comedy tour, the Celtic Tenors, and James Gregory, as well as Blues music giants Cool John Ferguson, Captain Luke, John Dee Holeman, Albert White, Beverly “Guitar” Watkins, and many more. Nearly everyone who works with Paul considers him a friend as well as a respected musician and producer. Call or e-mail Paul today to book studio time and become a part of the Studio 415 family!